Sparta was a state that believed in skills and knowledge over the high life and fancy architecture, the Spartan lifestyle was about preservation rather than celebration. This was reflected in the buildings and architecture of Sparta, simple and functional the Spartan buildings were that of farmers, and this is what Sparta was a collection of the toughest, strongest and most battle ready farmers in ancient Greece. While Sparta was a state, and indeed the most independent Greek state, it was not a city. Unlike larger city states like Athens where the city was a walled city, Sparta was much more free flowing and unconstrained. This open nature of early Sparta was due in part to many factors, the fact that Spartan were just that, Spartans, they had the respect of many, and no army would enter Sparta without careful consideration. Another factor was the geographical location of Sparta, which sat in the Laconia region of Ancient Greece, and afforded the Spartans some level of natural defence from invaders into their state. The site of the amphitheatre in ancient Sparta. Sparta was very much a farming state, the Spartan family home was simple and basic, and represented the similarly fashioned Greek farming housing of the time. It was typical for a Spartan home to be made of sun dried mud bricks, with red clay roof tiles. 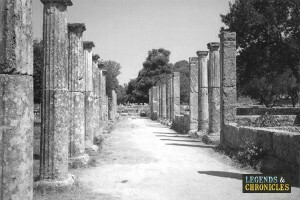 Homes would typically be single storey, but could have been two storeys, as we are aware they were in ancient Greece. The Sparta homes would often have a courtyard in the middle of the property, and the homes were often painted white to reflect the heat and keep the property as cool as possible in the hot Greek sunshine. While pursuing their training, the Spartan warrior would live in public barracks. While there are no remains of the barracks themselves we can presume they were very similar to the Spartan homes in construction, but with a more sparse interior. It’s highly likely they were similar in fashion to the Greek barracks of the time, where they would be either square with a courtyard, or a U shaped barrack with an open ended courtyard. The courtyard would be flanked with a roofed walkway around the edges providing much needed shade for anyone not participating in the activities at the time. Spartan Helots were afforded much more freedom than many serfs across ancient Greece, and in Sparta they were allowed to have their own property and homes, although the Helots property would never be as impressive as the Spartans. 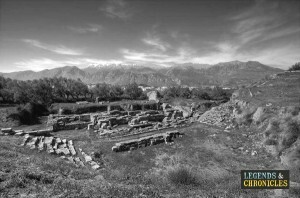 One of the remaining sites in Sparta is the ancient theatre. The theatre in its time would have been one the largest in ancient Greece, capable of seating over 15,000 Spartans. The theatre itself has the beautiful backdrop of Mount Taygetus and would have been spectacular when fully built. Unfortunately very little remains of what was ancient Sparta, which means our knowledge on their housing, architecture and buildings are limited. We do know they were similarly constructed to the Greek buildings of the time, and that the Spartans were not creatures of extravagance so we can only presume their buildings were indicative of their nature.